"Disclaimer: I received a free sample of Luvo Flipped Bowls as part of being a BibRave Pro. Learn more about becoming a BibRavePro (ambassador), and check out BibRave.com to review find and write race reviews!" So to say that we're beyond busy right now would be an understatement! 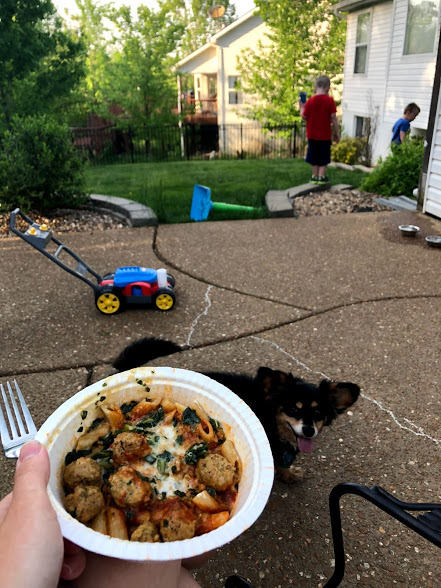 Summer is always full of fun activities with the kiddos, however on the flip side that leaves very little time for meal prep and sticking to any sort of healthy eating regimen. We do our best but often fall short. Enjoying a Luvo Flipped Bowl while watching the kiddos play outside! We were sent samples of their Flipped bowls, flavors included Chicken Meatballs in Tomato Basil Sauce, Chicken Meatballs in Garlic Wine Sauce, Chicken Meatballs in Creamy Stroganoff Sauce & Chicken Meatballs in Creamy Pesto Sauce. Every single time I ate one of these meals I swore that particular one was my favorite. They are just so delicious and full of flavor! While Luvo offers a wide variety of meals, these flipped bowls are at the top of my list personally and the meals I would recommend to those looking for a wholesome, plant based twist on these familiar meals. Packed with so much protein, 16g in which 1/3 of that is plant based, they are an easy and quick way to fill up without the guilt of other, less desirable, prepacked meals! Heading to work and had little time to prepare a healthy meal, so I went for a Luvo Flipped Meal! Head on over to Luvoinc.com and you can use code BIBRAVE at checkout which will score you one free meal when you order 7!